Forex Expert Advisor cannot be used after 2008 Financial Crisis. A forex robot will follow your directions no matter what. It won’t panic and close the trade because it feels like it opened it too soon or too late. It plays by the rules no matter the condition or status of the markets. Forex robots stay on until you turn them off. You could be sleeping or just enjoying time with your family. The robot will keep it’s eye on the market and trade according to the rules that you set. A forex robot is not a good solo strategy, because they are fallible. Not only that, but it’s good to understand the markets and trading that you are looking at, even if the robot is doing the work. That experience comes best as trading forex regularly. Forex robots can help you test and develop strategies that work, if you understand how to use them. It’s not likely that a forex robot will make you a millionaire, despite what you may have heard, but it could add a few points to your bottom line. Be careful who you deal with and always test them on demo accounts for an extended period of time before using them live. 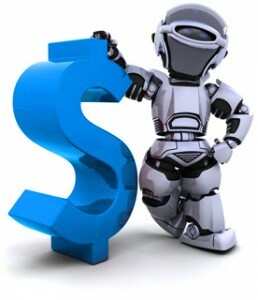 Forex robots or expert advisors (EAs) as they are more appropriately named are computer programs in which certain market criteria and strategies have been encoded so as to enable them place trades in the market automatically or semi-automatically. In a world where there is a continuous drive to provide automation to every human activity, the financial markets has seen a drive to develop software that can automate several aspects of trading so as to make the trader’s job a whole lot easier. We have seen software being developed to plot pivot points automatically without the trader having to undergo the drudgery of looking for the previous day’s close, high and low prices. We have also seen several computer programs that can alert traders to developing chart patterns, recognizing candlesticks, etc. Forex robots have taken it up by a notch to be able to put a number of criteria together to execute trades on the trader’s behalf. The advantages of using forex robots in trading are pretty obvious, and we shall take them one after the other. Many market opportunities do not always present themselves at a trader’s convenience. Sometimes, opportunities occur when the trader is engaged in some other human activity; when the trader is at work, in a meeting, on school runs, sleeping, etc. By being able to open and close trades on the trader’s behalf when attached to a chart on a running internet-enabled computer, the forex robot acts like a trader on the go. The forex trader can perform his normal day-to-day activities without interruption and still achieve his trading objectives. One of the trader’s greatest enemies is emotion. Many times, traders see market conditions which all seem to add up together for a profitable opportunity. Sometimes, one very tiny ingredient may be missing, and majority of traders succumb to the temptation to dare the odds and force the trade, hoping that everything will eventually align itself. We have all been there and found out that most of the time, it does not work. By being an unemotional and objective conveyer of the exact trading instructions encoded into them, forex robots deliver trading strategies into trades to the letter without clouding up the whole process with emotions. This is indeed a very strong point. Forex robots generate trading signals that can be copied and sold to other third party users. There are programs that can take the signals/trades generated by forex robots and copy them into selected accounts used by subscribers on the same platform. This can serve as a good way to monetize the performance of good forex robots. I know a trader who made $50,000 in one single seminar where he demonstrated the use of his forex robot and also made copies available to seminar attendees. Now it must be made abundantly clear that the strategy on which a robot derives its trading prowess has to be one that delivers profits most of the time. It is only for such robots that the advantages listed above can apply. There are many poor quality robots in circulation; some are just outright scams. Make sure you get the value of what you are paying for so you can enjoy the advantages of using a forex robot. At last, all robot today cannot use because of volatile market. Contact us for the proper trading method.